As the Vikings welcome prospects to their new facility in Eagan on Tuesday for the start of their top-30 event, their attention has mostly shifted from free agency to the draft, which begins three weeks from Thursday night. Their addition of former Bears receiver Kendall Wright this week, though, shows they’re still in the market for veterans who might fill a niche on their roster. And they’ve still got the cap room to pull off a few more moves. After the addition of Wright — whose 2018 deal is worth $1 million — the Vikings have $17.995 million left in cap space, according to NFLPA records. That gives them plenty of room to sign their draft picks, add another player or two and still roll some space into next season, when they’ll need room to give new deals to players like wide receiver Stefon Diggs, defensive end Danielle Hunter and linebackers Anthony Barr and Eric Kendricks. Wright, who signed his one-year deal with the team on Friday, received $400,000 in guaranteed money, in a contract that will pay him an $800,000 base salary, $100,000 signing bonus and $100,000 workout bonus. The Vikings are still carrying $2.12 million in dead money after releasing Jarius Wright, but the price at which they signed Kendall Wright, combined with the dead money, is still less than the $3.6 million base salary that Jarius Wright would have earned, if he’d played on the third season of the four-year extension he’d signed in 2015. Punt returner Marcus Sherels, who signed a one-year deal with the team last week, will make $1.4 million this season. Sherels’ deal included a $1.05 million base salary, a signing bonus of $250,000 and a workout bonus of $100,000. 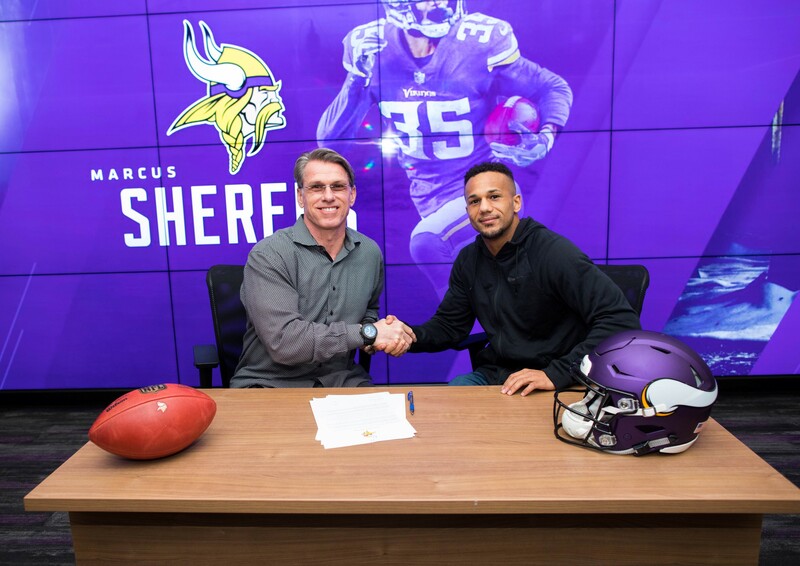 Between his signing bonus and $250,000 of guaranteed money in his base salary, Sherels received $500,000 guaranteed for the season. The Vikings are still open to bringing back Terence Newman, who turns 40 before the start of the 2018 season, though coach Mike Zimmer made it sound at the owners meetings last week like the cornerback’s return could come down to money. The team also hasn’t restructured the contract of defensive end Brian Robison, who turns 35 this month and is due to make $3,5 million this season. In any case, even if the Vikings sign another veteran or two, they should have well over $10 million in cap space remaining after they sign their draft class. They’d need to hold onto some of that money for needs that might arise during the 2018 season, but they should be able to roll over some cash into the 2019 league year, when contract extensions for some of their young players would likely hit the cap. The Vikings signed three players to contract extensions during training camp last year, and it wouldn’t be surprising to see them move to finalize a deal or two before the start of this season (though it might behoove some of their younger players to wait until closer to free agency). Whenever those deals get done, the Vikings should be in strong shape, thanks to a salary cap that figures to jump again in 2019 and a financial framework that, as usual, has been prudently managed.